Dunk tanks have been an event favorite for many years. Get a well-know local personality, get them to site above the water tank, and you have a classic show. 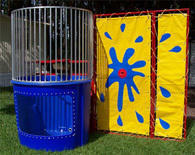 Bounce Orlando not only has the classic Dunk Tank rentals, but have a some interesting and fun twists on the concept. Browse the selections below and click on the title or image for more information and to make a reservation. Copyright © . Bounce Orlando LLC. All rights reserved.